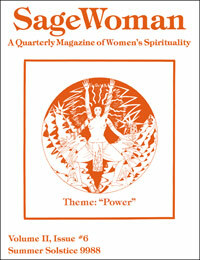 SageWoman #6 (reprint) Power [sw006p] - $7.95 : BBI Media - Magazines that feed your soul. Wow! This is one of the most striking of the early SageWoman issues. Including artwork by Sudie Rakusin throughout, articles by Joanna Macy, Z Budapest and Shekinah Mountainwater, and pieces with provocative titles like "Granny the Samuri," "Vocal Self-Defense", and "Power Animals", make this issue a standout. PLUS: this is the very first issue to include SageWoman's long-standing reader feedback column, the Rattle. 52 illustrated pages. Edited and published by Lunaea Weatherstone in Summer 1988.